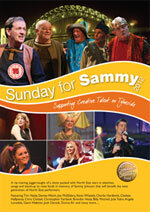 Sung by Terry Conway, Benny Graham, Johnny Handle, Jim Mageean and Brian Watson. on sheet music and instruments used in the period. 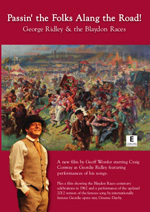 There can be no doubt that if you asked any member of the public, here or abroad, to name a Geordie song, 'Blaydon Races' would be the first and 'Cushie Butterfield' the second, both written by George Ridley. Not a bad legacy, particularly because, if you asked the same question of any other provincial English city, you'd be lucky to get one. 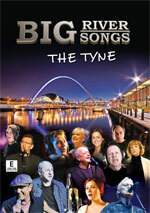 No wonder then the Geordie anthem's 150th was celebrated on Tyneside, and certainly by the musical fraternity. Here we have a book, a CD and a DVD, co-ordinated by Northumbria Anthology, an outfit set up by Brian and Helen Mawson with the aim of promoting north-east traditional music and song. The CD gives us all of Ridley's sixteen known songs, performed by a clutch of the finest singers on Tyneside (Terry Conway, Benny Graham, Johnny Handle, Jim Mageean and Brian Watson), with musical arrangements by Vic Gammon. No Geordie he, but Vic brings his academic expertise to present the songs with an authentic touch. He has sought to give us the feel of what they would have sounded like at the time, though we don't have any information as to how Ridley performed them. Certainly the performances on this album are of the highest quality, but I began to understand how it was that, apart from 'Blaydon' and 'Cushie Butterfield', none had come down to the 1960s folk revival. 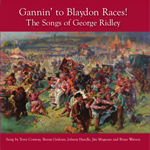 The unitary district of Northumberland is to be lauded for its musical contributions to the world including as it does Billy Mitchell, Lindisfarne and Jack The Lad etc and perhaps none more so than the unofficial anthem 'Blaydon Races' written by George 'Geordie' Ridley. This 19th Century song captures the very essence of the community at the time and performed in glorious recitation by Benny Graham conveys the fun in the chorus with its extended holding on the word 'roaaaaad' (think Newcastle United supporters on a beery match afternoon!) joined by members of The Whole Hog Band. This recording of Ridley's classic, along with the other 16 songs he penned in his short life should form a part of every 'folk music' lover's CD collection. 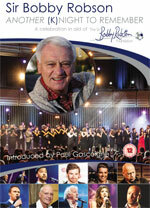 On the album, the 'music hall' genre of which the song is a celebrated fixture also features Ridley's other 'hit' 'Cushey Butterfield' and less well-known gems 'Joey Jones', 'Cabman' and 'Harry Clasper' performed by artists including Jim Mageean, Johnny Handle, Brian Watson and Terry Conway. Credit must also go to the arranging skills of Vic Gammon and the wonderful team at Mawson-Wareham who have more or less single-handedly taken the reins in promoting the spirit of Northumberland. With an eye to capturing every 'entertainment market' there is an accompanying DVD on the story of Ridley (featuring actor Craig Conway) produced by Ray Raidlaw & Geoff Wonfor and, as if that wasn't enough there is also a sumptuously packaged book by author Dave Harker providing the reader with everything you needed to know about this most colourful character and the hopefully never to be forgotten era of the music hall. Talking of which... I nearly forgot... if you're looking for a good old fashioned sing-a-long then look no further, it's a wonderful collection!